CLINTON, Md. (CNS) — Visitors to Mark Twain’s hometown of Hannibal, Missouri, can see a whitewashed fence like the one that Tom Sawyer tricked his friends into painting for him in the novel. 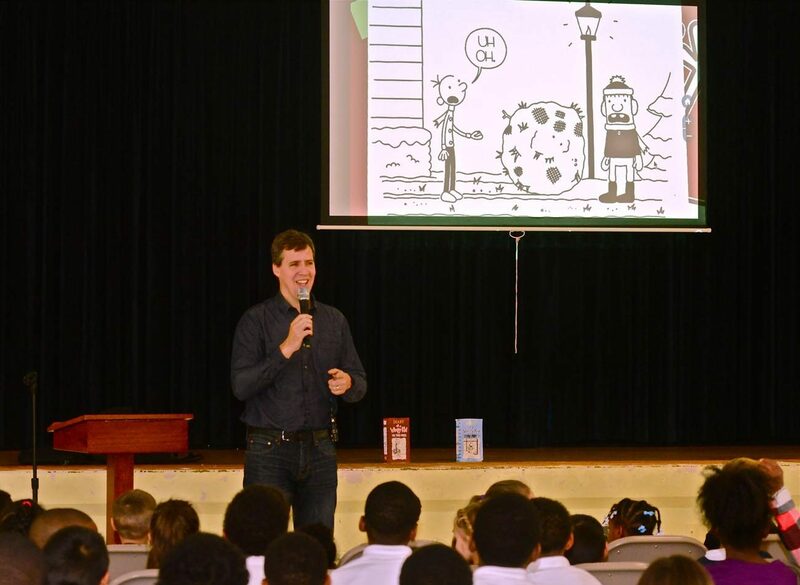 In Clinton, students and teachers at St. Mary’s School of Piscataway learned that their Catholic school and parish in the Archdiocese of Washington has a special connection to a modern children’s classic, “Diary of a Wimpy Kid” by Jeff Kinney. In early November, the day after his 11th and newest book in that series, “Double Down,” went on sale, the best-selling children’s book author visited St. Mary’s School and shared his memories of going to Mass and attending teen dances at the parish while he was growing up and was something of a wimpy kid himself. “It’s so cool to be here. Believe it or not, 30 years ago I used to attend dances here,” Kinney told a school assembly of 180 prekindergarten through eighth-grade students. “I tried break dancing” here, he said, before asking kids if they knew what that dance move was. He and his friend used to think that when people at Mass there shared the sign of peace, it sounded to them like, “peas be with you,” which made them laugh. “I got in trouble lots of times for laughing in church,” Kinney confessed. But his biggest revelation came moments later. “The ‘Cheese Touch’ started at St. Mary’s. It’s one of the reasons it’s important for me to come here,” Kinney said. “Right outside, under the basketball hoop was a piece of cheese. None of the kids would touch it. You can tell people you went to school where the ‘Cheese Touch’ started! '” he said, as the kids looked out the window. “Beware of cheese!” he added. The Nov. 2 visit marked a homecoming for Kinney, who said he wanted to start the world tour for his new book by coming home to Maryland. Kinney said he got into the first and only fistfight of his life as an eighth grader, when he and his friend got into a disagreement, and the kids around them were chanting, “Fight! Fight!” a scene that later appeared in the book and movie with the two boys squaring off awkwardly, not knowing how to fight. Then there was the time his older brother woke him up in the middle of the night and told him he had slept through the whole summer and it was time for the first day of school. Young Jeff Kinney then went downstairs at 3 a.m. and made breakfast for himself, as if it were a school day, and his father caught him and asked what he was doing. Kinney was inspired by comic strips such as “Calvin and Hobbes” and “The Far Side,” and he dreamed of being a cartoonist someday. “As a kid, I fell in love with the comics,” he said. His University of Maryland character Igdoof once made a surprise appearance in the panel of the comic strip Big Nate, after he had corresponded with that strip’s creator, Lincoln Peirce. “That’s the moment I knew I had to be a cartoonist,” Kinney said. After college, Kinney was not able to become a syndicated cartoonist, but he kept a journal of funny things that happened to him over the years. “Funny things happen every day,” he said. He converted those ideas into an online comic strip, and later a book publisher asked him to rework them as a children’s book. 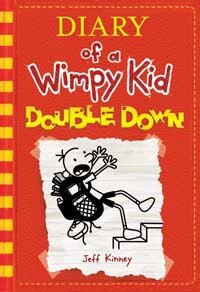 “Diary of a Wimpy Kid” was published in 2007, and his books have been best-sellers since. “I feel really lucky it worked out,” said Kinney, who noted that his success came after receiving a lot of rejections from publishers. In an interview with the Catholic Standard, Washington’s archdiocesan newspaper, Washington, Kinney — who now lives in a Massachusetts town with his wife and two sons in middle school — said that in New England, people often find community life in their towns, but when he grew up in Maryland, his Catholic parish and Catholic high school were places where he found a sense of community. In the past decade, “Diary of a Wimpy Kid” books have been published in 42 languages, and a special milestone happened last year, when the Latin version was presented by the priest who translated it to a smiling Pope Francis at the Vatican.